I designed the ant guard in OpenSCAD to take advantage of parametric design principles. What this means is that I can easily adjust parameters like the size of the cup to accommodate larger quantities of water or thicker hooks. The cup was straightforward, and I chose a conical-shaped cylinder for aesthetic purposes. The pillar inside the cup was necessary to prevent tilting of the cup. Using a half-o-ring shape for the attachment point seems to provide sufficient structural integrity (read: I haven’t snapped this one off yet like I did in some other prototypes). The bottom attachment is also a half-o-ring and may need some improvements before heavier bird feeders are used. 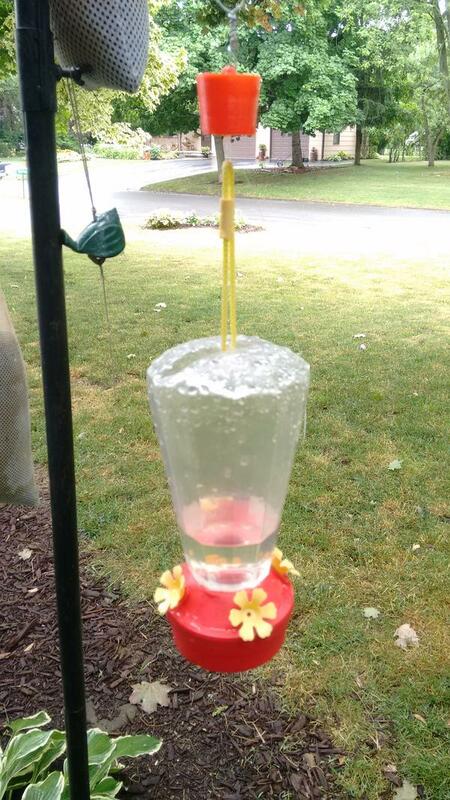 However, for the plastic hummingbird feeder we currently own, it seems to be working sufficiently well. The design files can be found over at Thingiverse. Have a look there if you are interested in printing/modifying one of your own. CAVEAT: as I just mentioned, the bottom support may not be suitable for heavy (read: glass) birdfeeders. Think about this design before you use it with Grandma’s hand-blown-glass antique hummingbird feeder. If you’re property is damaged because you didn’t heed this warning, feel free to sue me. If my net worth were worth something, I wouldn’t be 3D printing objects I could buy from Amazon for seven bucks. This entry was posted in Make and tagged 3D Printing, Garden. Bookmark the permalink.